Golf is one of the most relaxing sports in the world. It doesn’t require rigorous movements such as jumping or running. Instead, it focuses on accuracy in hitting long range and short range shots. It’s a challenging sport that uses physical strength, intellect and strategies. Though it is a relaxing sport, it is important that golf players wear comfortable clothes, shoes and accessories to help them play better. Golfers often have to walk to get to the next course. A good Taylormade golf shoe will help golfers play betters since their feet are relaxed and comfortable. Here are some tips on how to choose a good Taylormade golf shoe. Like other shoes, the best types of Taylormade golf shoes are lightweight, flexible and sturdy. It should be light and easy on the feet. Heavy shoes often cause pain and uneasiness which can be distracting when playing sports and doing other physical activities. Aside from that, a lightweight shoe will help you move faster and better. The shoe should be flexible. A good golf shoe is not restricting and can follow all your movements. Wear the shoe and try bending and flexing your feet, see if the shoe also bends and flexes. The shoe must be sturdy enough to withstand different climates and temperatures. Also keep in mind that the golf shoes should be able to last in different courses. Remember that each golf course has a different landscape and soil type. Some are covered in grass, others are rocky while others are sandy. Make sure that the shoe can be used in this type of area. Find a golf shoe with a foam sole inside. This type of shoe is very comfortable and sole friendly. Your feet will feel relaxed standing on a soft sole with breathable space. Also look for a golf shoe that is waterproof and has a moisture wicking feature. Some golf courses have lakes and ponds, while some are even muddy. There’s also the chance that it will rain during one of the golf matches so it’s best to be prepared. A waterproof golf shoe will protect your feet from getting wet and keep you comfortable even on rainy days. The waterproof wicking feature will prevent your foot from sweating inside. It keeps the inside of the shoe airy and breathable. Aside from that, it absorbs the sweat to keep your feet dry. A wet foot is not something you’d want when playing golf. Choose several pairs of golf shoes and try each one on. Try walking around with the shoe on. See if it’s comfortable. Make sure that it’s not painful to wear and that there’s enough breathing space for your toes.Try standing in different positions and see if the shoe can follow various feet movement, angles and positions. Another important tip to remember is to choose golf shoes that are not only comfortable but fits your personality. Golf shoes come in different styles and colors and it’s recommended that you choose the one which suits your personality and outfit. Some players are often affected by their outfit and how they look in their clothes and shoes. A comfortable shoe that fits your personality and style can help you perform better if you feel relaxed, comfortable and look good. The golf shoe is very important to every golfer. Like golf clubs, it can affect one’s performance in the game. If the shoe is not comfortable, painful and feels wet, golfers are distracted from the game. On the other hand, a golf shoe that is comfortable, waterproof and flexible helps golfers focus more on hitting the ball rather than how their feet feel inside the shoe. That’s why investing in a good Taylormade golf shoe is a great idea. 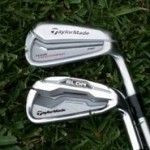 Rockbottomgolf and Burner golf clubs, balls, apparel, and accessories are only the latest incarnation of Taylormade golf promise of improvement and perfection in everything they sell.